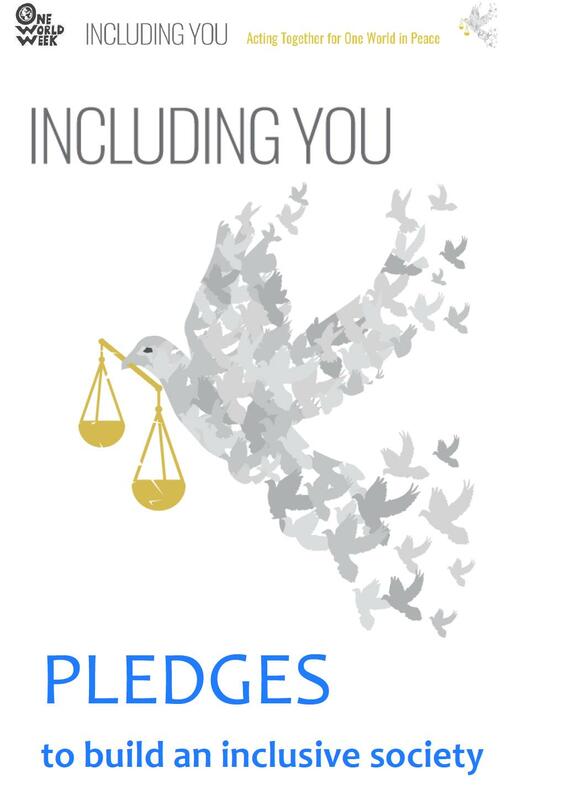 This booklet contains: ideas for how to use the pledges; dove templates on which to write pledgespledges are presented in a format which enables you to print and cut them out and fold them into cards. Download here (word.doc) a version of the Pledges which can be printed and cut out for large dispalys. A set of pledges about what we can do to inspire a culture of hope to build a more equal and peaceful world. - a dove template on which to write them. A set of pledges about living sustainably and 'being more'. Be aware of your power to make a difference. By taking a stand to live peacefully you will not only enhance your life and the lives of those around you but your actions will spread the idea of peace far and wide. Remember, peace is not just an absence of war; it is also environmental stability, economic and social justice, and understanding. 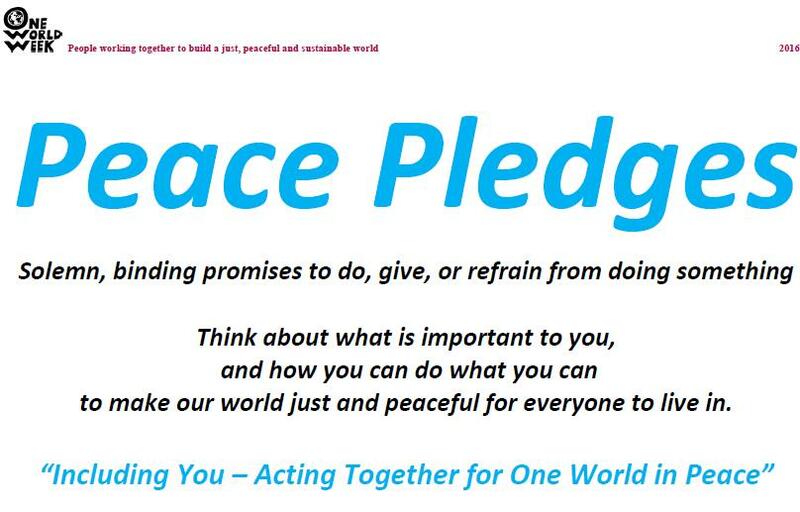 You can use these peace pledges or write your own. Think about what is important to you, and how you can have an impact in creating a culture of peace for our children. OWW events are about learning how we can make a difference and following up that learning with action. So suggest to all participants at your events that they sign up to one or more of these pledges. 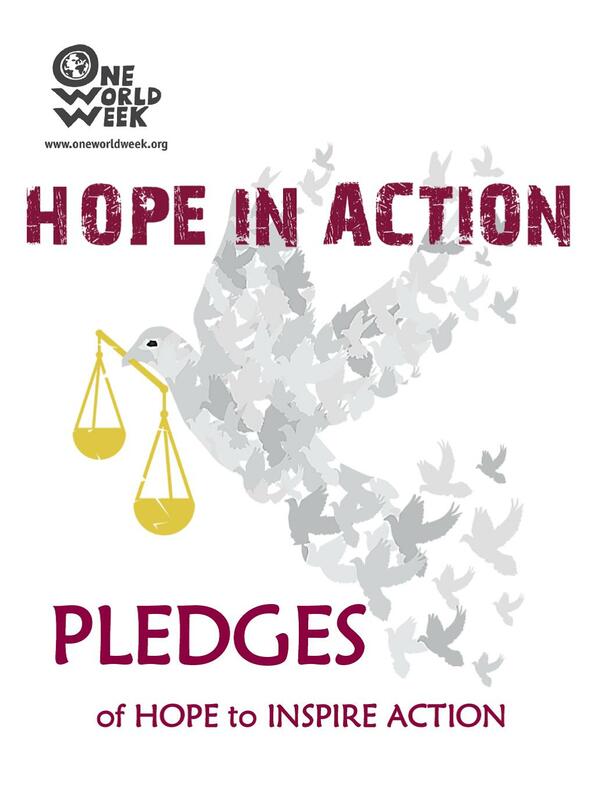 Below the pledges there are suggestions on how you could use this resource at a One World Week event. Because the struggle for global peace needs to continue until we are successful. And while the decade may be drawing to a close and much has been achieved, there is still a lot left to be done. Because it is good to know that your savings don’t finance the arms trade or hold developing world debt. Because while the world’s major religions advocate peace, people’s perception is increasingly that religion is the cause of violence. Greater understanding decreases suspicion and increases friendship, unity and solidarity. Because it develops relationships, forges a sense of community and makes us feel part of where we live. We can look out for each other, so everyone worries less and has greater personal peace. Because these projects can bring people together, improve relationships and develop the community. Because taking this time to escape the stresses and strains of everyday life will calm your body and mind, giving you a sense of inner peace. Because when we pent up our anger and worries we disrupt our inner peace and are also more likely to lash out at others. By writing things down you can order your thoughts. You can throw the writing away afterwards to symbolically dispose of your negative feelings, give your letter to someone and ask for their help or understanding, or simply take time to re-read what you have written and seek a way through the problems. Because praying for peace can be a powerful and positive experience, and all faiths teach the importance of peace. Because if everyone can follow this example we would all be treated with love, kindness and respect, and this would bring peace and harmony to the world. Because it is good to have somewhere quiet to retreat to when life is too hectic. Opening this space up to others will give them the opportunity to find inner peace, and will create a more peaceful community. Many people don’t have access to fresh water, and what the world does have is running out. Some experts think that we will soon be fighting ‘water wars’ because of this shortage, so we shouldn’t waste what we have. Because buying fair trade means a better deal for the producers, which allows them to feed and educate their families, access healthcare and develop their communities, bringing peace to all those around them. Because if enough people speak up change will really happen. Because all that wasted energy is damaging to the environment, and we need to have environmental stability if we are to achieve and maintain peace in the long term. Because they break down so much quicker than their equivalents and so damage the environment less. Because if we work together and help one another, everyone is better off. It will create stronger friendships and lasting peace in your world. Because it produces less waste so it is kinder to the environment. Deforestation ruins indigenous homesteads and animals’ habitats, creating social and environmental instability. Because it uses a lot less water to produce grains and vegetables, therefore preserving valuable resources. It will also create a more peaceful relationship with the environment. Because other crops are sprayed by highly pollutant insecticides which not only damage the environment but the communities around the farming areas. Health, economic and environmental sustainability are key aspects in ensuring lasting peace. Because local produce uses less energy than do goods imported by air. Most imported Fairtrade produce comes by boat – so it uses less CO2 energy in the production costs than local glass house crops. Supporting your local farmers will bring peace and stability to your community, and poor farmers in developing countries depend on export crops and a fair wage for their living. Because wood consumption is so high that many forests are being illegally logged. This symbol verifies that your wood is from a sustainable source. Because it saves 50 litres of water to take a shower instead of a bath. The UK has less available water per person than most other European countries. The amount of CO2 produced in a year by an average family’s water consumption is the same as a return flight from London to New York. Therefore, saving water will help alleviate climate change and can make the water scarcity problem in another country less severe. It will also save you money on your water and energy bills. Because whether it is an apparent miscarriage of justice which has been reported in the media or a local event in your school, community or workplace, writing a letter is powerful tool on the side of right. You cannot have peace without justice. Because the more people who buy fair trade the bigger impact we will have on gaining trade justice and changing the lives of producers around the world. 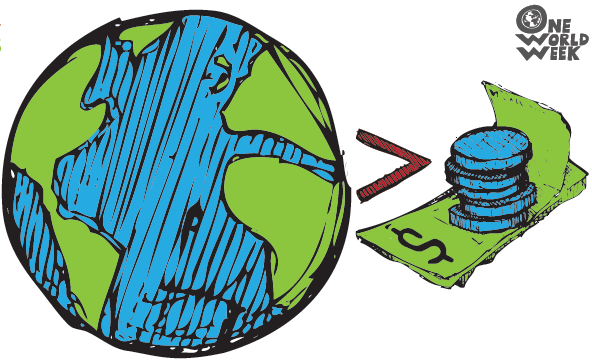 Because when charities have a regular income rather than occasional gifts, they can plan better and use the money in more efficient ways to implement and sustain peace and justice through various initiatives. Because although 60% of household rubbish could be composted, 80% of it is ending up in the local landfill site. As these sites fill up new land must be found to dump waste, which damages the local community and the global environment. Because you save money, get to know new people, and limit the consumer demand for ‘throw away’ plastic toys. You will create peace at the personal, local, and global levels. Because it creates less waste, so you are helping the environment. Because billions of pounds are wasted every year on unwanted gifts. But through Oxfam or Christian Aid (among others) you can buy packages that deliver a beautiful card to your friend and chickens, medical equipment or a goat to a family in the developing world. Peace cannot be achieved without simultaneously combating poverty. Because it will help to limit the amount of plastic bags that end up in landfill sites, killing helpless birds and animals. Because slower driving will cause less accidents and will lower your CO2 emissions. You will help to ensure safety in every community you drive through and help to limit climate change. Because by putting on a cosy jumper instead you are helping to limit global warming and the damage that it does across the world. Because talking calmly solves a lot more problems than shouting or lashing out. To remember all the soldiers who have fallen in battle since WWI, to support the care of the families that have been left behind and to signify your dedication to peace. Because it is important to remember that aggression is not the answer, and that with patience, words and peaceful action you can bring about real change for the better. Because praise inspires people and encourages more of the same. Because they will put the bad news into perspective, demonstrate the success of the ‘Ubuntu’ ethos and inspire people to believe that a better world is possible. Hold an OWW Peace Pledge event! You could separate the pledges from the reasons, and ask people to match them back together. Put all of the pledges into a ‘Pledge Box’ and take it in turns to pick one out. Discuss how the pledge could be implemented. Put your pledge into action and make sure you regularly check how well you are doing. Encourage others to join you, and keep each other motivated. Display your pledges by writing them on strips of brightly coloured paper and linking them together in a ‘Peace Pledge Chain’ that could be displayed in your office, school, place of worship or community centre. Have a Peace Pledge Tree, or create a collage of colourful hand prints with the pledges written over them.